» Pressure Cooker vs. Steamer – What’s the Difference? Pressure Cooker vs. Steamer – What’s the Difference? Pressure cookers and steamers offer efficient and quick tools for cooking healthy and flavorful meals. They can be used to cook a wide variety of different foods. While the two terms are often used interchangeably, each item is different and serves its own unique purpose in the kitchen. If you are trying to decide which one is the better option for cooking the meal of your choice, be sure that you understand the basic differences between the two. As the name indicates, a steamer utilizes steam from boiling water to cook vegetables. Although a pressure cooker operates similarly to a steamer, its design features a locking mechanism that traps the steam inside of the cooker to create much higher internal pressure levels. The higher pressure levels mean that the internal temperature of a pressure cooker is much higher than that of a standard steamer. Not only can a pressure cooker be used to cook vegetables, but it can also be used to cook meat, beans, rice, and some types of soup. There are many different types of steamers to choose from. They range from simple basket inserts, which are used to cook vegetables, to electric steamers, which can be used to cook grains and small legumes. Steamer basket inserts are valued for their simplicity and effectiveness, while electric steamers enable you to simply set the timer and walk away. Pressure cookers primarily come in one of two different models: electric countertop versions and non-electric stovetop models. 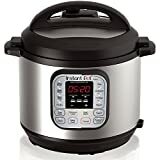 Pressure cookers are available in a wide variety of different sizes, ranging from four quarts up to ten quarts, but larger models are available as well. Each option offers an effective method of cooking meals. Steamers are inexpensive and simple to learn how to use, but pressure cookers allow a cook to exercise greater control over the food they are cooking because exact settings can be programmed into the cooker. Pressure cookers can also be used to cook a wider variety of food stuffs that steamers cannot – like meats. Electric pressure cookers also require a greater amount of electricity than a non-electric steamer does. Pressure cookers generally cook food more slowly than a steamer does, which must be taken into consideration when planning a meal. Retaining the structure of the food that is being prepared. Unlike other methods of food prep, the food will not lose its shape. Vegetables will not turn into a mash or puree. Retaining minerals and vitamins. Steam cooking is the only cooking method available that does not disturb the molecular structure of food, which is crucial to retaining its healthiest elements. Retaining the color and taste of the food. Steam cooking retains the original color, taste, and freshness of the food that is being prepared. Spices can also be added to the water during the steaming process to give the food a special taste. Pressure cookers and steamers each offer their own set of benefits. Ultimately, the decision regarding which option you should choose will come down to personal preference. For example, how much time are you willing to invest in cooking your food? There is no right or wrong answer! Why don’t PC manufacturers publish the actual Psi for their respective cookers? Read somewhere that a PC must reach 15-lbs. pressure (minimum) in order to cook/can properly . Thanks. I like the explanation of the differences between the two types of cooking.